Interview with one of my favorite gardeners, my grandma! Did you garden as a child? Yes, we had a big garden. My older brother George was in 4-H, so he got really into gardening, and we depended on our garden for food. It was all food, no flowers: tomatoes, squash, beans, peas, carrots, lettuce, spinach. It contributed to our winter food supply, too, as my mom canned 250 quarts of tomatoes in the fall into juice or tomatoes. We had to pull weeds every morning, and then we had the rest of day to do what we wanted. Once my brother George had 50 big Hubbard squash stacked to take to the farmers market the next day, and someone stole them in the night. Also, when I was 14, we rented a house on 11 acres near Mound, MN, just for the price of the taxes (my mother was a widow with 7 kids to support, so this was a great deal for us). The man we rented from told us if we took care of the Concord grapes and 30 or 40 apple trees — and the roses, too — we could eat all the fruit we wanted. He showed us how to dig around each fruit tree and mulch them. Then one day his mother came around with some of her wealthy friends to show them the yellow roses in their circular bed, and she saw all the apples and said, “Don’t pick any more.” She wanted them for herself. So that night we picked 2 gunnysacks full and stored them in the cellar. What is your favorite edible to grow? Tomatoes because I like to eat them fresh, and they make such a difference in a salad. The skins are so tough on the tomatoes you buy in the stores nowadays; they breed them to have tough skins for shipping, and they pick them half green. They just don’t taste the same. Neither do the cucumbers and all the others. Everything tastes better when it’s picked right off the vine. What is your favorite annual to grow? Petunias and snapdragons because they’re hardy and they last until a pretty hard frost, especially the snapdragons. What is your favorite climber to grow? Morning glories and passion flower. What is your favorite perennial to grow? Irises, peonies and tulips. My husband always reminisced about seeing his mother carry water to her peonies. What is your favorite gardening tool? A great big screw driver, 12 inches, heavy metal. I could really dig with it. For weeding, I could get down in the ground and twist it. It was good on dandelions and anything with tough roots, including thistles. What is your favorite gardening chore? Weeding. I hate weeds and could hardly enjoy just sitting in the yard. I’d sit in the lounge chair and see weeds and get up and start pulling them. I get a lot of pleasure getting rid of weeds, especially when I can pull all the roots, like after a hard rain. What is your least favorite gardening chore? Trying to dig or weed when the ground is dry and hard. I would take a hose and let it drip slowly in the area I was going to work in. Which, of all the places you have lived, was your favorite garden? Patricia Park. The tulips and the sweet alyssum did so well. And we had apple trees and peach trees. We planted a lot of fruit trees throughout our marriage but usually never lived in one house long enough to enjoy the fruits. I also loved our acreage on Indian Trail (Afton, MN), where we had rose bushes and canna lilies that I inherited from 2 of the teenage boys who had lived there and were studying horticulture. We also had raspberries, and one year I had a good crop of corn. I planted corn there the next year, and it didn’t grow well. That’s when I learned I needed to practice crop rotation. My 3rd favorite was in our part-time retirement home, the Schoolhouse in Crocker (South Dakota). The first thing we did was plant a shelterbelt with trees — lilacs, evergreens, honeysuckles and oak (which never made it) — that we ordered through the extension office. Because there aren’t very many trees in South Dakota, the extension office encourages people to plant a shelterbelt around three sides of the yard. They were all about one foot tall in 1977, and now they are all taller than the Schoolhouse. The evergreens are more than 30 feet tall. The first year, almost all of the shelterbelt died because it was too dry and we weren’t there to water them. The next year, we re-planted and mulched and had more rain and they grew. Now they advise not to plant too much of one thing because of diseases and aphids and other insects. A couple of years later, we ordered 25 shade trees from a nursery, including flowering crab, ornamental cherry, locust (we ordered 2 mountain ash and 2 locust but instead received 4 locust) and willow (which did great even when it didn’t get much water). We also bought 6 apple trees, and when we realized we’d ordered the kind of apple trees that take 7 years to bear, we bought some dwarf trees so that we could have apples right away. It was such a job to spray that we never sprayed again after the 1st year. So even though we still get apples, what the bugs don’t eat, the birds poke holes in. Still, we get about 10 bushels of apples every other year because every other year you get a bigger bounty. We had a few trees come up by themselves from neighboring trees, like the cottonwood, which is messy, and some elm trees, which are more like a weed now. But we didn’t know the shelterbelt would do so well, so we let them stay. We planted Russian olive trees on one side of the yard in hopes it would make a living fence, but they got so rank and scratchy that we dug them up and got rid of them. We also had raspberry plants, a bunch of asparagus, garlic, chives, and strawberries. We ordered Concord grapevines and planted them on the west side of the tennis court. I smelled them when we were playing tennis, even though they were still green. So I tried one, and it tasted like a Concord grape, even though it wasn’t purple. And we ate asparagus every day from May 15th to July 1st. We loved it stir-fried; then you don’t boil all the vitamins out of it. It is one of the best veggies you can eat, but it takes 2 to 3 years to get it started. And I planted one envelope of chive seeds, and they came up every year and spread. I transplanted it to various places; and if you cut it back after they bloom, they will re-bloom. How much time would you typically spend gardening in a summer? Did you ever hire help for your garden or did you do it all yourself? What was your worst weed? I like coleus and my orange tree and hibiscus (me, too). But I like too many to pick just one. Get advice from someone who knows what they are doing — like Melissa at Mel’s Green Garden! And ask nurseries or your extension office for help. For example, my raspberries were turning yellow. It had been a wet spring, and they suggested I pull away the mulch. Also, buy from nurseries or order from catalogs that are reputable. When our trees died out, they replaced them; reputable places will do that. Also, start out small. Our acreage in Afton was too big and I could not get caught up enough to have the time I wanted to play golf and tennis. We ended up planting 125 trees so that we didn’t have to mow but then decided to move to a condo for even more time for golf and tennis. But then we bought the Schoolhouse in Crocker, on a 3-acre square city block! Planting too close to the house is a common mistake. You should plant shade trees 30 feet from the house. Lilacs will choke out evergreens, so keep after things like that and cut them back. And cage peonies because the blooms get so heavy. Mulch with straw and hay and grass clippings. And take care of your body. Bend at the knees, not at your back; and when you can no longer bend your knees, sit on a big garbage bag and slide along. What is the best advice someone gave to you? Be sure you have the right soil for anything you’re planting. We’d planted evergreens up and down our driveway in Afton, and the first planting died out because of the clay soil. The next time, we added sand and they did well. The same with the tulips — they got too wet and rotted so the next time I planted with sand. 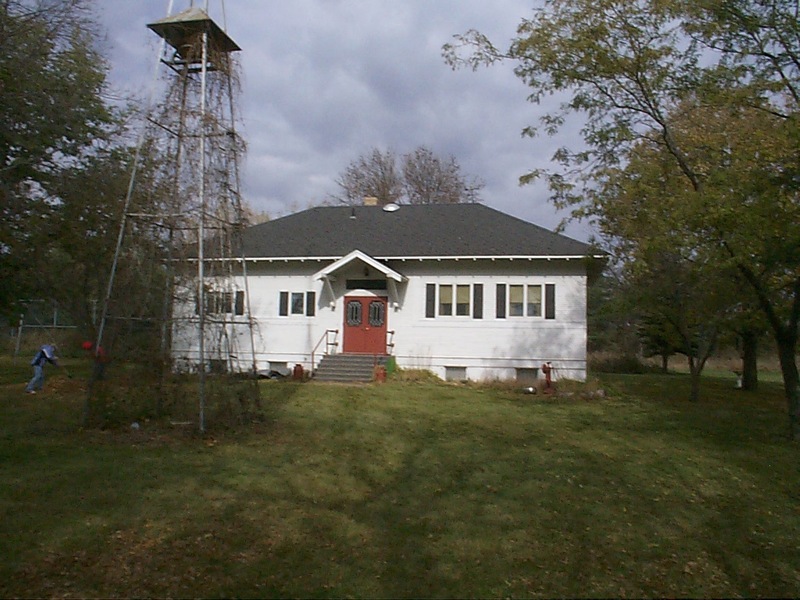 Schoolhouse in Crocker (South Dakota); my grandpa attended this school.